Take 5! Institute offers training and ongoing support for the individuals and organizations that work with children, youth, and families in diverse settings, including classroom teachers, counselors and administrators, child and youth workers, early child educators, mental health professionals and social service providers, as well as those supporting youth who are engaged with the justice system. With an initial training workshop, you’re ready to introduce Take 5! to the young people in your classroom or other community setting, and to share challenges, successes and insights with your colleagues. There’s no need for certification, nor a need to invest in additional curricular resources. All that’s needed is a commitment to learn, and to share that learning with the people in your circle of influence. Take 5! to Thrive provides a basic foundation, preparing educators and other professionals to introduce the Take 5! approach within classrooms and other community settings. Take 5! 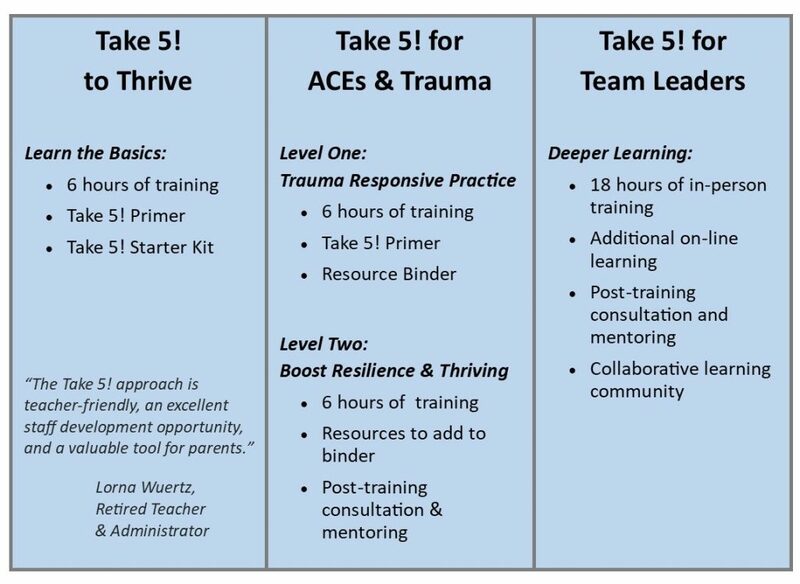 for ACEs and Trauma introduces Take 5! as a practical approach that integrates trauma-responsive practice with everyday social-emotional learning and self-regulation asset-building. Take 5! for Team Leaders is the next-level training for professionals who want to deepen their learning and practice. It will be especially helpful for those who play a leadership role in their school or other professional setting. 6 hours of training for individuals, school-based teams, district-based teams and/or multidisciplinary professional groups. Take 5! Introductory Primer – an in-depth introduction to the Take 5! assets, as well as the principles and hands-on practices that guide Take 5! Self-Reg Asset-Building. Take 5! Starter Kit for Educators – the kit includes posters and other visuals, as well as practical tools and learning activities.